Join us in raising Colon Cancer Awareness by wearing this Got A Cure? Colon Cancer Shirt. Perfect for both him and her to show their never ending fight to end colon cancer once and for all. 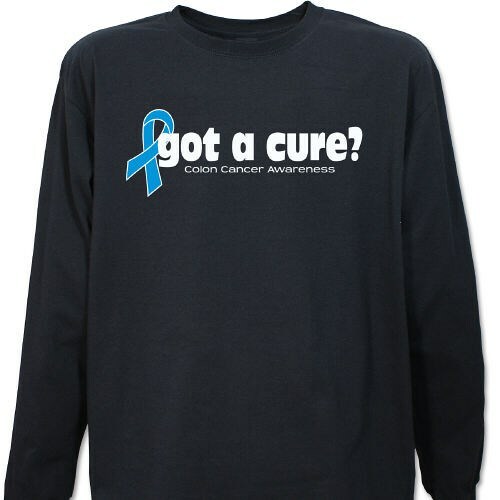 Our Colon Cancer Awareness Long Sleeve Shirt is the ideal shirt to wear at awareness events & walks in your community. Each Awareness Shirt for Colon Cancer is available on our premium 100% cotton long sleeve shirt, machine washable in sizes youth S-L & adult S-2XL. Additional Info Our goal, at MyWalkGear.com, is to raise public awareness and understanding of Colon Cancer along with many other cancers & diseases. We are proud to help make a difference in the lives of those who are diagnosed with colon cancer so we have created a selection of unique Colon Cancer Awareness Apparel and Gifts for you and your loved ones to help spread awareness. You will also love to wear our Got A Cure? Colon Cancer Sweatshirt and show awareness with our Colon Cancer Awareness Hat. You’ll feel great knowing a portion of our proceeds will help fund research so one day this disease will be something of the past.